Glittering, glowing, and geometrically powerful, celestial objects have been popular motifs in art, antiques, and design for centuries. Stars and constellations were named in ancient times for gods and animals they resembled. The sky humbles us and the celestial elements we see from earth have long been inspiration to artists and artisans. 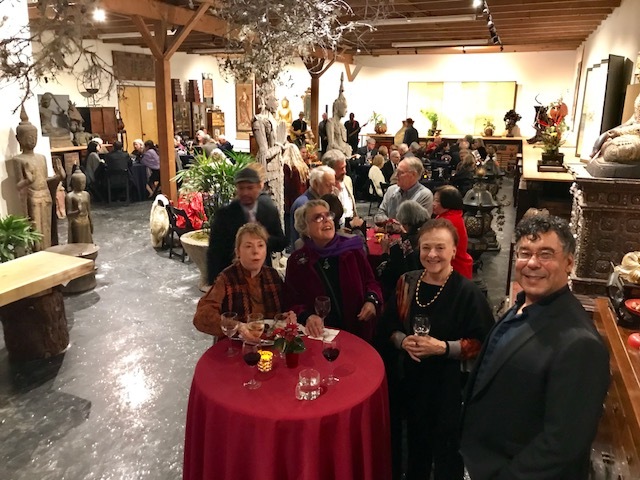 2017 Asian Art Museums Christmas Party! The San Francisco Fall Art & Antiques Show is the oldest continuously operating international art and antiques show on the West Coast. The Show features approximately sixty dealers from across the United States and Europe, offering for sale an extraordinary range of fine and decorative arts from around the world representing all styles and periods, including furniture, silver, ceramics, glass, jewelry, rugs, textiles, paintings, prints, photography, books, sculpture and objets d’art. With a hometown nod to the 50th anniversary of the historic Summer of Love, this year's theme springs from the beauty and romance of blooms and blossoms. Floral imagery has long been part of a rich visual symbolism in art, be it mythological, religious or romantic. Flower Power is fertile ground for cultivating a uniquely curated assortment of art and antiques. The San Francisco Fall Art & Antiques Show is fully vetted to ensure the highest quality merchandise. Showcasing incredible examples of fine Japanese, Chinese and Korean works or art from 1860 through the 1926. Examples include, tansu, painted works, mixed metal, hardwood furniture, ceramics, baskets scholar objects and much more. Exhibition inspired by the recent major motion picture: Silence written by Japanese author Shūsaku Endō, and directed by Martin Scorsese, 2017. The Portuguese first arrived in Japan in the middle of the 16th century, bringing guns and God along with them. Bearing gifts and preaching the gospel, the Jesuit Francis Xavier was the first European to succeed in spreading Christianity into a Buddhist and Shinto land. Email or Call if you have any questions regarding Current and Upcoming Events. We encourage you to email ahead for an appointment.